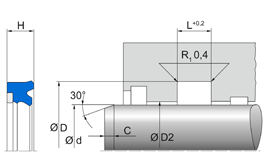 The Merkel U-Ring TM 23 is specially designed for sealing the piston rods of plungers, pushers and subsidiary cylinders in selfadvancing support systems. To meet the requirements of a higher radial deflection and larger gap bridging, the Merkel U-Ring TM 23 has been fitted with an increased pre-load and active back-up ring. 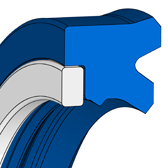 The second sealing edge provides extra protection against the ingress of dirt particles.